The photograph depicts some of the furniture designers working in Grand Rapids in 1916. First Row: Francis Fry, C.A. Lauzon Co.; V.L. Mershon, Davies-Putnam Co.; Tom Handley, Johnson Furniture Co.; Lachlan MacLachlan, Berkey & Gay. Second Row: William Balbach, Phoenix Furniture Co.; James Tillitson, Jr., Michigan Chair Co.; Arthur Kirkpatrick, Houseman Bldg. ; R.R. Tunnicliffe, Grand Rapids Tea Tray Co.; E. Berkey Jones, W.A. Berkey Co,; Charles O. Nash, Retting Furniture Co.; John D. Raab, John D. Raab Co.; W. L. Kimerly, Grand Rapids Furniture Co.
Third Row: Stanley H. Stirrup, Luce Furniture Co.; Rene Guenaux, Sligh Furniture Co.; Otto Jiranek, Ashton Bldg. 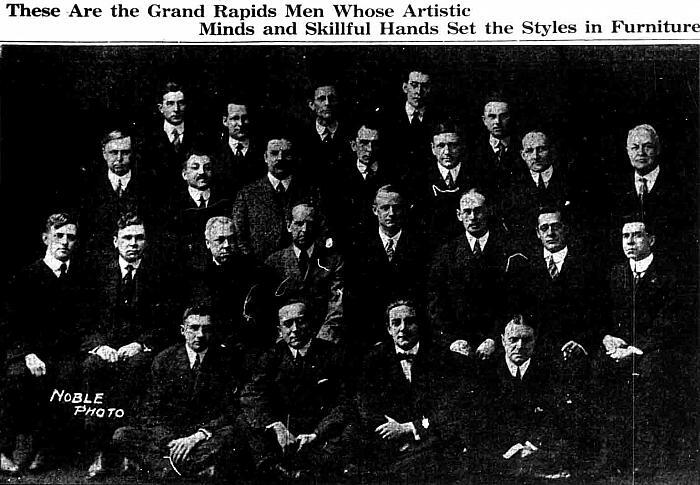 ; William J. Bergman, Grand Rapids Chair Co.; Frank Stone; H.N. Hall. Top Row: Ralph Widdicomb, John Widdicomb Furniture Co.; L.W. Hall; C.T. Graham; George J. Pike, John D. Raab Co.; Hans Berg, C.S. Paine Co.
Coll. 255-3-2, History & Special Collections Dept.